What recreational updates would you have installed in Liberty Park? Scott Renshaw: Massage tables. Tell me that wouldn't be the single most used public facility. Jeff Chipian: It's time to re-open the gladiator pits! We need champions to be crowned and blood to be spilled. The tradition of our forefathers must be brought back to this day and age. Or they can put in a cool turf football field for everyone to use, whatever is easier. Jeremiah Smith: I would lobby very hard for a Thunderdome to be installed. I feel like that is just the kind of family entertainment that Liberty Park is lacking. Ryan Carillo: A permanent bounce house for adults, not kids. Brandon Burt: A "no cryptosporidium" section in the swimming pool. Bryan Bale: Maybe they could build a "slip-n-slide" that runs the entire length of the park. It wouldn't even have to be funded by taxpayers; just get Exxon to foot the bill and call it the Broken Pipeline. Josh Scheuermann: Any large population with a controlling majority needs an open-burn pit for educational books and the devil's brew! That's how the "Literature, Music, Fun, Alcohol and Obscenity" Pit will be created! L.M.F.A.O.! Jerre Wroble: Liberty Park needs a miniature railroad that winds through the aviary, glides around the pond, jigs and jags through the drum circle and then spring-loads its passengers into—or at least nearby—the swimming pool. 1. What sport was invented 50 years ago in a suburb of Seattle? 2. What sport is widely believed to be named after a dog? 3. What is called "the fastest growing sport you never heard of?" 4. What sport will have a facility completed this month on fifth Avenue and C Street? Chances are the under-50 folks are stumped. So here's a hint: All four questions have the same answer. And the answer is? [drum roll] Pickleball! 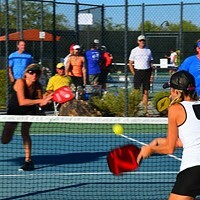 Pickleball is a tennis-like game played with a solid paddle and a perforated plastic ball. The net is 2 inches lower than a tennis net. The sport was invented in 1965 by the late Joel Pritchard, a congressman from Washington. He cobbled together handmade plywood paddles, a whiffle ball and a badminton court to create a game for his kids. Two stories compete as the source of the name. One is about Pritchard's ball-chasing cocker spaniel, Pickles. Another comes from Pritchard's wife who wrote in 2008, "The name of the game became pickleball after I said it reminded me of the pickle boat in crew, where oarsmen were chosen from the leftovers of other boats." Interest in the sport took root in Sun Belt retirement communities and spread like dandelions. As more and more Baby Boomers put aside their tennis racquets and golf clubs, many took up pickleball paddles. There are several reasons for the sport's popularity. It is more forgiving than tennis—especially on aging knees and slowing reflexes—and it is a game which rewards deft tacticians, not heavy hitters. Learning the basics takes only a few minutes, and the game has an infectious, transgenerational appeal. That appeal is evinced each year at the Huntsman Senior Games in St. George, where the pickleball competition is capped at 500 players. An annual tournament in Ogden draws players from around the country and Canada with $3,000 prizes for top finishers. Brigham, Tremonton, Hurricane and Pleasant Grove hosted local tournaments last year. And then there is Salt Lake City. Utah's capital has dawdled on the shore and watched as others like Ogden, Riverton, Sandy and Bluffdale caught the wave. If you want to play outdoor pickleball in Salt Lake City, you have only four options: a temporary court at the Gallivan Center or a tennis court striped with pickleball lines at Reservoir, Pioneer and Sunnyside parks. A fifth option becomes available by the end of June: The city's first outdoor courts will open on fifth Avenue and C Street at about the same time as four new courts in Riverton are finished. Next year, a six-court pickleball complex will be built as part of a renovation of the 11th Avenue tennis courts; and Jordan and Riverside parks will each gain two courts. By next summer, then, the city will have 12 outdoor pickleball courts—four more than Ogden, four fewer than Bluffdale. The city's plodding pace belies the explosive growth of the indoor pickleball subculture along the Wasatch Front. In 2010, only Dimple Dell Recreation Center offered pickleball on three makeshift courts. Today, there are more than 30 indoor courts in several recreation centers. On weekday mornings, players set up portable nets and play on courts laid out side-by-side in the gyms. Some are tennis players with worn-out knees. Most are retirees. As they wait on the sidelines to join a doubles match, they chat sociably. They are quick to invite a visitor to try her hand at "the fastest growing sport in the country." Pickleball partisans like me have been lobbying for outdoor courts for the past three years. We have attended meetings in Salt Lake County, and we have badgered Salt Lake City's Parks and Public Lands Department (P&PLD). Along the way I have learned that pickleball is not the only squeaking wheel. Walkers, bike riders, dog owners, inline skaters, disc golfers, tennis players—all want accommodation. But it is a zero-sum game. If the P&PLD builds tennis courts at Fairmont Park, as it might do, the upshot may be that disc golfers make do with what they've got until money becomes available. There is never enough money, however, and when dollars are a deciding factor, politics comes into play. Politics impedes the least-expensive option for pickleball: converting two existing tennis courts into six pickleball courts. The P&PLD owns about 90 tennis courts. Many are idle; many need resurfacing. But most of them have a guardian angel in the guise of an elected official. The prospect of a single tennis court being given over to an "upstart sport" like pickleball is dismissed out of hand—a hidebound reaction, I think. After 50 years, pickleball is not a fad that will fade as inline skating did. The data are clear: Tennis is on the decline; pickleball is on the rise. Salt Lake County groks it. Its new Southwest Regional Park in Bluffdale, where the median age is 27, will have 16 lighted pickleball courts—and none for tennis. If Southwest Regional Park is the future, Liberty Park is the past. Its 16 tennis courts are certainly part of my past. I have spent many hours hitting tennis balls there over the years. I have no doubt that I will hit pickleballs there sooner rather than later. In the meantime, the good people running the P&PLD have an opportunity in booming Sugar House. If the plan is to build new tennis courts in Fairmont Park, then pickleball courts ought to be included. To do otherwise is to ignore the handwriting on the wall. Why no funds for blossoming sport?